Our holiday house is located in a quiet and peaceful neighbourhood in Bohinjska Bistrica, in close vicinity to Kobla and Vogel ski centres, 5 km from Bohinj Lake. The apartment is purposed for 2 to 4 persons and has two separate bedrooms (one double room, one room with two single beds). It is very comfortable and nicely furnished. Kitchen with lounge and SAT TV, bathroom with shower are on the ground floor, balcony and two bedrooms are situated in the first floor. Children can play in front of the house; your car can also be safely parked in front of the house. There is a terrace next to the house, where you can rest and have a picnic. The house is a great starting point for trekking and mountaineering, bathing in the lake or nearby Aquapark. The price includes bed linen, towels. The apartment equipment offers coffee machine, toaster and oven, hairdryer. Fishing: Fishing in Bohinj is a great experience. Our apartment is located in close vicinity to all fishing areas. You can also rent or buy fishing gear in Bohinjska Bistrica. Aquapark: Bohinj Aquapark is located 500 m from our house, 10 minutes walk. Aqua park Bohinj has 380 square meters of interestingly shaped pools and special – dedicated pool for children – are filled with 34°C spring-clear water. Depth in the swimming pool is 1.35 m.
Those keen on climbing can test their skills on climbing wall located by the big pool. With the fast-river, two water slides and music cave and other water attractions there is loads of fun for everyone. Different Sauna types are widely used around the globe. We have all types of saunas available for those interested in warmth and coziness our Sauna Park offers. Riding: The diverse countryside of Bohinj is perfect for both beginners and experienced riders. Thanks to the calm nature and flexibility of Icelandic horses at Mrcina Ranch, even beginners can take a comfortable horse ride to the nature after an initial training. Horse riding tours in Bohinj are extremely diverse, from ascents to smaller hills (Senožeta) to riding across the Pokljuka plateau. They are possible all year round. All tours are guided. We absolutely loved our stay in this gorgeous village. I was travelling with my parents and, although the apartment is 'cosy', it had everything we needed and was very clean. Doris and her family were very friendly and gave us great recommendations for visiting the surrounding area. We loved this place! The house was perfect for a family with two small children like ours. All amenities were present and the owners were very friendly to help in case of requests. The area was beautiful and less than ten minutes walk from the centre of town. The stroll to town was very pleasant following the river where trout swam. 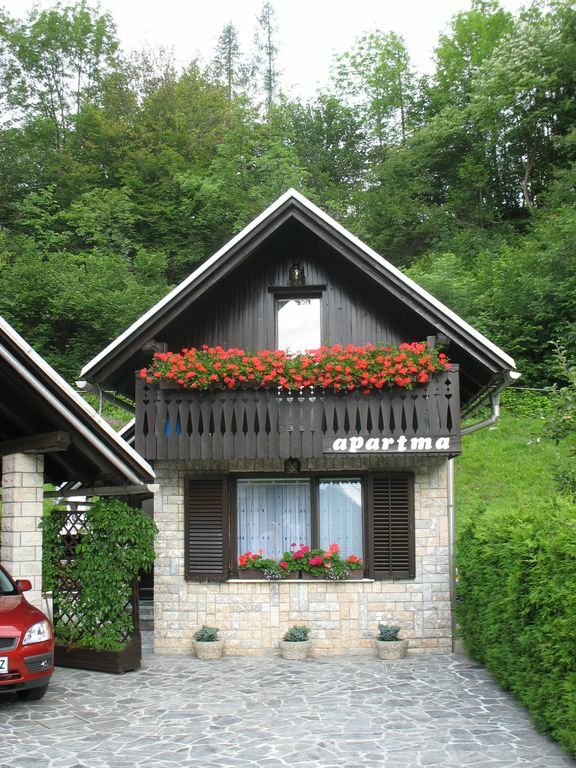 The appartment is located 20 minutes from lake Bled and 10 minutes from lake Bohinj by car. We would definitely recommend the small house to anyone. Insgesamt GUT, für drei Erwachsene etwas eng. Waren allerdings auch nur drei Tage vor Ort. Bonita casa en una zona tranquila del pueblo. Muy limpia y con todas las comodidades, pero un poco pequeña si te quedas varios días. Los dueños muy amables y atentos, pero la entrada de su casa está al lado y no tienes intimidad. Las toallas muy pequeñas!! Sind bereits das dritte Mal vor Ort am Bohinjska Jezero und das zweite Mal in der Unterkunft Zvan. Äusserst gut gelegen im ruhigen Teil vom Ort mit fussläufiger Anbindung an alle möglichen Aktivitäten und Versorgungspunkte. Austattung der Unterkunft ist zweckmäßig und optimal für Selbstversorger und -kocher. Weitere Preise erhältlich bei einer Anfrage. Aufenthaltstaxe für Erwachsene: 2,00- EUR, Kinder: 1,00 EUR (7-18 Jahre) pro Tag.